NUO Hotel Beijing, cooperating with Dream Park and Notting Hill, held the NUO LOVE Wedding Show on November 11 in Beijing. The wedding show began at 2 pm. Hotel manager Michael Tan gave an opening speech to welcome all of the guests. The show included a wedding dress show, a jewelry show, an exhilarating tango show and a lucky raffle. But the highlight was the wedding show itself. Guests were invited into a photo booth and placed with a real wedding scene featuring a front-projected holographic display setup to help them choose a dream wedding scenario. NUO Hotel Beijing deployed its world-class culinary team headed by Executive Chef Nikolaos Lekkas to design and create delicious food and drinks for the guests. Before the show, guests enjoyed an outdoor cocktail party at O'Bar, a bar in NUO Hotel Beijing, with a large outdoor terrace space that can also be used for weddings and other events. Snacks were served and a special kind of cocktail was created by hotel beverage manager Attila Balint. 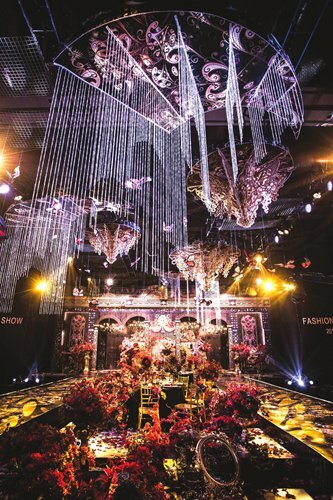 After the show, the hotel staff guided guests to the top floor of the hotel, introducing NUO's Bridal Suite, with its Ming Dynasty style interiors and luxurious features. Located near Beijing's Art Zone 798, NUO Hotel is the first five-star flagship hotel under NUO's brand. With China's dynamic art movement, NUO Hotel Beijing showcases a contemporary unique design inspired by the prosperous age of Ming Dynasty and its literature, art and culture. And it has become a perfect example of tradition blending in harmony with the future of contemporary China. Art, literature and music, the ultimate expressions of culture are displayed in the hotel for guests in striking ways. The hotel serves as an art destination in its own right, with dedicated artwork created by the country's most critically acclaimed artists, from newly emerging to world-renowned in the hotel lobby, guestrooms, suites and the food and beverage. Among those artworks, there are four exclusive, custom-created artworks by Zeng Fanzhi, known as "China's greatest living artist." Zeng is the honorary art consultant for Beijing NUO Hotels Management Co., Ltd. and created two majestic masterpieces, Le Shan, a silver and bronze sculpture and an oil painting Landscape 2014, which are the dramatic centerpieces of the hotel's grand lobby.